It may be some people's ideal way of enjoying one of Taiwan's most beautiful scenic locations: hiding away in one's own personal chalet with natural hot spring water on tap in a nearby building and a masseuse on hand to smooth away any anxiety brought on by the sound of crunching glass as the tour bus sped through one too many tunnels on the road up from Hualien. 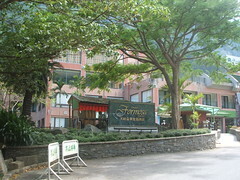 This, at least, was the vision recently promoted by the proprietors of the Grand Formosa Hotel, located in Taroko National Park's Tien-siang Village, as the new face of this famous tourist destination, to be realized through collaboration with the head of the National Park Administration, Huang Wun-cing. 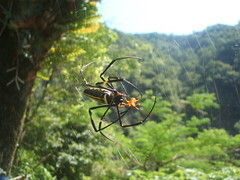 However, since this Build, Operate and Transfer (BOT) plan involved disregard for several laws protecting the Park's resources and the rights of local aboriginal people, and threatened to turn the public area around Tian-siang into a sweeping extension of the Hotel's private grasp on the village, Wild at Heart's National Park expert, Lynn Lin, spearheaded a successful campaign to push a pin in the conspirators' bubble. 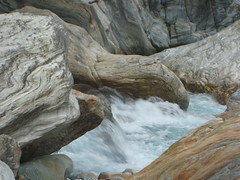 According to the Hotel's investment plan, water would be channeled from a point on the Liwu River 1km south of Wen-shan hot springs, a popular semi-natural bathing spot that was closed off in March 2005 after a bather was killed by falling rocks. As those familiar with the Park will be aware, the fragility of the hillsides is becoming more apparent with each passing typhoon, as well as unrelated landslides. 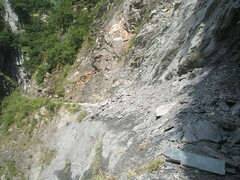 Several of the trails around Tien-siang have been closed in recent months due to debris flow; Bai-yang trail, for example, now ends abruptly halfway with a loose pile of rubble, and not surprisingly, considering the powdery bedrock that towers overhead on either side, interspersed with sections of stone. 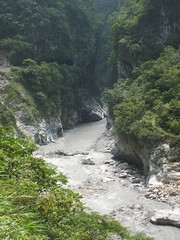 Ms. Huang, however, had little to say about the potential harm that could be caused to the structure of the gorge by drilling, nor the fact that Taiwan's Hot Spring Act forbids exploitation of what the developers had identified as a hot spring outcrop. She also attempted to bypass restrictions on development of "special scenic areas" by redefining the planned development area as part of the Tien-siang "recreation area". A brief prepared by Lin, listing altogether twelve suspected legal transgressions, was shared with legislators, who requested a thorough investigation by Minister of the Interior Lee Yi-yang. Points included neglect of environmental impact assessment (EIA) duties and the Administration's failure to meet Freedom of Information requirements by refusing to disclose details of the contract to legislators. Lin also criticized the attempt to privatize natural resources that belong to the Park, as suggested by the Hotel's proposal to commandeer the hot spring water for use in its planned resort, and to sell off any "excess" water to local residents. Meanwhile, the Taroko People's Self-rule Promotion Association responded to the actions of the ostensible guardian of their ancestral lands by holding a press conference on 5 May, declaring violations of the 2005 Aboriginal Basic Law (原住民族基本法). 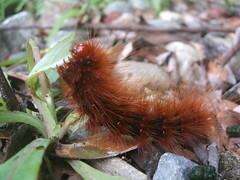 According to the Association, the Taroko Administration and developers had held only perfunctory consultations with tribal representatives, ignoring the Law's requirement for developers to obtain the agreement of local aboriginal people, and to set up a common management system in the planning of scenic or recreational areas, or resource management systems, within traditional aboriginal territories. 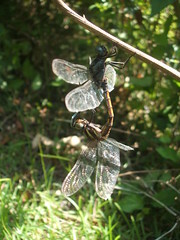 Minister Lee concluded his investigation with orders to remove the hot spring element from the proposal, and for the Environmental Protection Administration (EPA) to establish whether an EIA should be carried out for the remaining aspects of the project, to which the EPA gave an affirmative response. Left with nothing to put in their hot tubs, however, the Hotel proprietors quickly decided that it was no longer worth going to the trouble of expanding the Grand Formosa Hotel facilities. 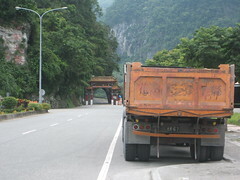 Their contract with the Park Administration was annulled at the end of May, marking a success for the Gorge, Taroko protesters, and all others who value the natural beauty of the untouched parts of the Liwu River, as well as granting a leave of stay for small food and souvenir vendors in Tien-siang that would have been removed due to the BOT project. It also brought an end to another episode of Taroko trouble for Lin, who is presently working with over sixty Taiwanese groups and several legislators to have Ms. Huang replaced with someone more committed to the task of protecting the Park from drill-wielding opportunists. 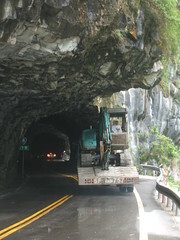 Also see Taipei Times article, "Resettled Truku blast plans for hotels in Taroko park"